The most eco-friendly, durable and portable yoga mats available today! As a full-time travelling yoga teacher, I’ve had a lot of experience with the best travel yoga mats! In this guide I pick my favourites and help you choose the right travel yoga mat for your adventures. 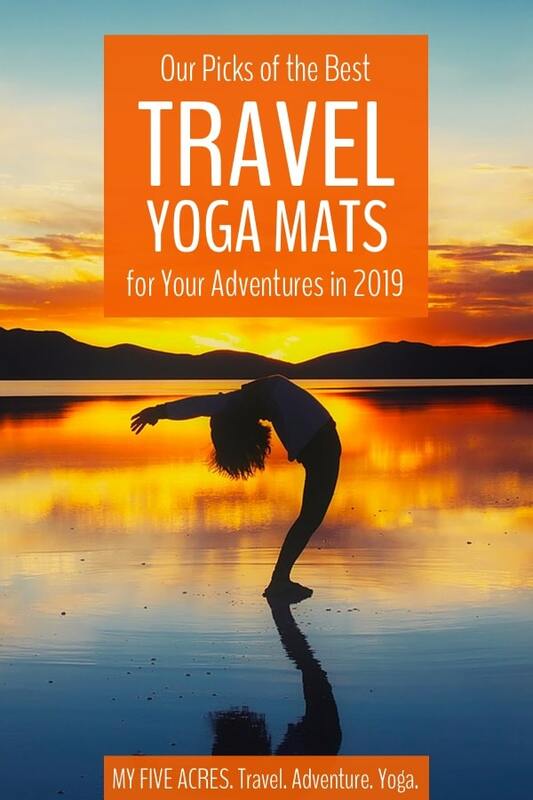 What’s in my guide to the best travel yoga mats for 2019? Since I am a full-time travelling yoga teacher, students often ask me for advice on the best travel yoga mat. They’re looking for a compact yoga mat to bring on big adventures without much hassle. During the last few years I’ve had a chance to try out all of the mats on this list (except one). Below, I share travel yoga mat reviews for my favourites. I also reveal which yoga mat I personally carry around the world. The JadeYoga Voyager travel yoga mat folds easily. JadeYoga made the original natural rubber yoga mat — they basically invented the eco yoga mat — so they have a lot of experience when it comes to minimizing environmental impact. Jade Yoga travel mats are made sustainably with natural rubber and they do not contain PVC, EVA, heavy metals, or synthetic rubber. The Voyager folds up to about the size of a yoga block, so it’s super easy to pack in my suitcase. If you’re looking for a light yoga mat, at 0.7 kg (1.5 lb), the Voyager is the lightest on the list! However, the company recommends the Voyager only for travel use because its portability reduces the durability. 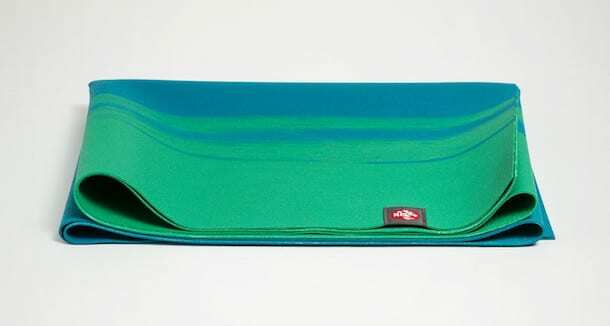 If you want something a little more durable, but still portable, the Jade Travel Mat might be a better option. I have tried the Voyager and I really like it. It feels similar to the Manduka eKO SuperLite but the Jade Voyager weighs a couple of hundred grams less. 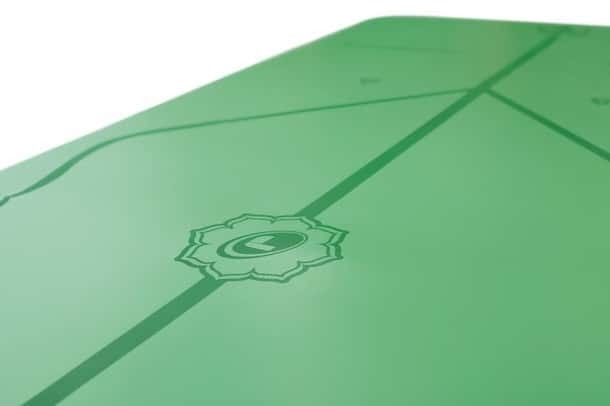 Like most very thin travel yoga mats, you won’t get any padding out of the Jade Voyager. If you have sensitive knees, go for a heavier, thicker mat. 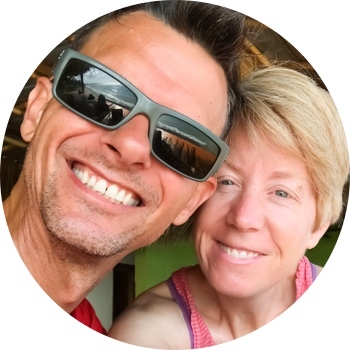 JadeYoga has one of the most impressive giving programs we’ve seen. First, they plant a tree for every product they sell. They also give $5 from every mat sale to various causes, including breast cancer charities, ovarian cancer research, and autism causes. They also regularly donate yoga mats to community charities and give money every Earth Day, Black Friday, Cyber Monday, and Giving Tuesday. 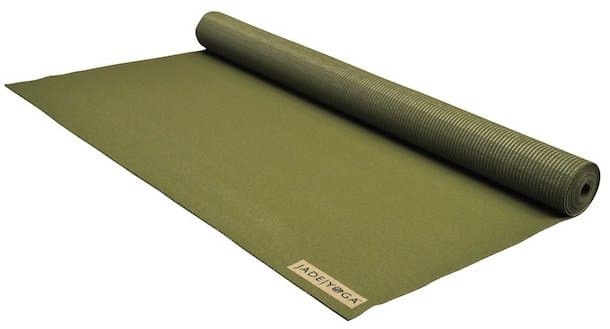 By the way, at $40 the Jade Voyager qualifies as a cheap travel yoga mat, too. I wouldn’t spend less on an yoga mat, as cheaper ones tend to be bad quality, bad for the environment, and bad to practice on too. The Yoga Design Lab travel mat is a great choice for travelling yogis who like to sweat. When Yoga Design Lab contacted us about their eco-friendly, foldable travel yoga mat, we were immediately drawn in by their story. 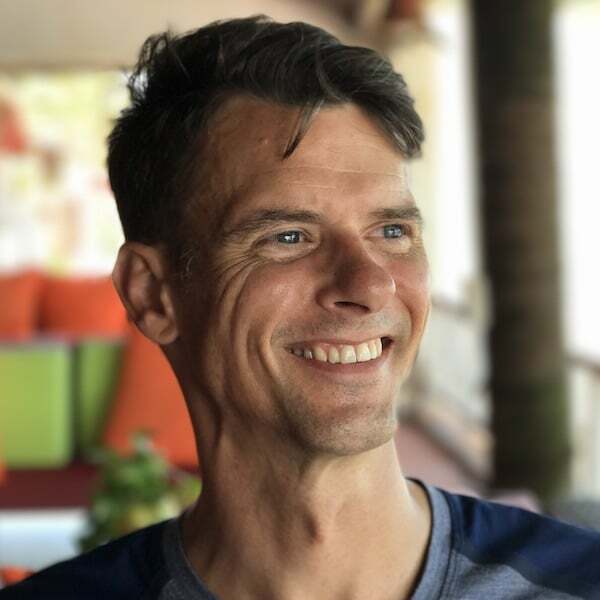 Owner Chad started the company while on holiday in Bali, after seeing a sea of boring single-coloured mats at the Yoga Barn. He created his own line of mats, with a silky-soft texture and gorgeous prints, using recycled materials. The mats are also machine washable, so what’s not to love? Yoga Design Lab mats are made from two layers: one is natural tree rubber and the other is recycled plastic water bottles. In case you’re worried about practicing on plastic, rest assured that the bottles are completely sterilized before being turned into the colourful microfibre layer of the mats. The designs are created using eco-friendly water-based inks. The Yoga Design Lab travel mat folds up small enough to fit easily into my suitcase. Plus, because of its two-layer construction, it seems to be a little tougher than the travel yoga mats made by JadeYoga and Manduka. The Yoga Design Lab mats have been specifically designed to perform well in hot yoga classes – they stick better when wet. 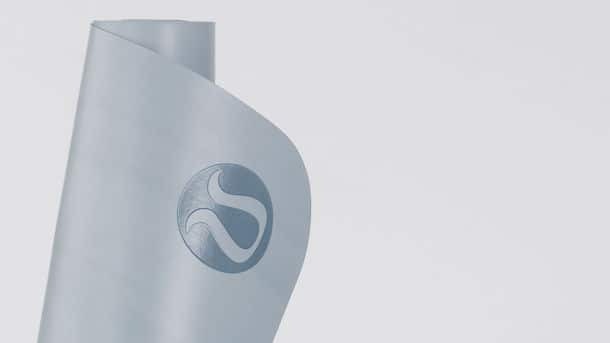 The soft absorbent surface takes the place of a yoga towel when you’re practicing hot vinyasa. Since Jane and I don’t really practice in hot studios, we sprinkle a little water at the top and foot of the mat before practice, which turns it from slick to sticky. We’ve also heard that after a few washes this mat gets much stickier. Jane will be folding this up and carrying it in her suitcase, so we’ll update you in a few months! As far a comfort goes, the silky, fluffy texture of this mat is so different from most yoga mats, it makes just lying on it a pleasure. The mat is a little thicker than most travel mats but obviously won’t provide the cushioning of a non-travel mat. Yoga Design Lab gives $1 for every mat sold to support various urban youth yoga programs around the world. For yogis who travel a lot, the Yogo foldable travel mat makes it easy to pack up and go. When I asked my Facebook fans what travel mat they would recommend, the Yogo name kept popping up again and again. This thin yoga mat is the most packable yoga mat on the list and is the one Jane carries in her suitcase. Since it’s designed specifically for travel, the Yogo travel mat folds up tiny and even has built-in straps to keep it folded. It’s also machine washable and can be hung from its straps to dry. As with all the best yoga mats, the Yogo Travel Mat is made with eco-friendly materials. It is biodegradable natural tree rubber that comes from renewable rubber plantations. Yogo makes much of the tiny proportions of their mat when folded, and it IS small – though the JadeYoga Travel Mat also folds to about the same dimensions. I do love the inclusion of the straps on the Yogo mat, to keep it compressed when it’s folded. As for durability, the company claims it can be used as a travel mat or an everyday mat — though we can’t back that up since we haven’t tried it. The Yogo is most sticky when dry, so it’s a great choice for non-sweaty yogis who don’t practice hot yoga. If you’re a hot yogi, grab the YogaLab mat instead! Comfort-wise, it is very similar to all the travel mats on this list, so don’t expect much cushioning! The Yogo team partners with two NGOs, Trees for the Future and Sustainable Harvest International, to plant a food tree for every mat sold. These initiatives help support poor communities in Latin America and Africa by creating a sustainable source of food for communities, while also helping to restore the environment. Manduka eKO SuperLite travel yoga mat. Manduka offers two options for travel yoga. 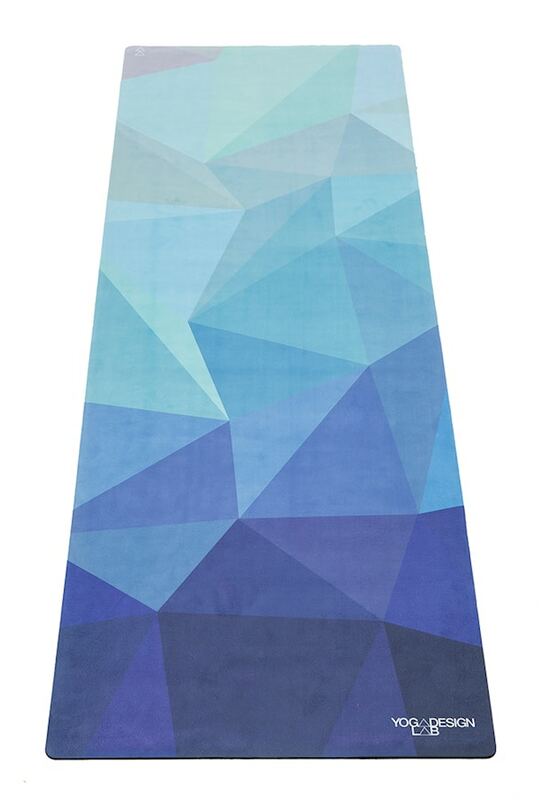 First is the eKO SuperLite, a super lightweight yoga mat. Then comes the eKO Lite, which is a little heavier, but adds more comfort. If you’re looking for a non-slip yoga mat, a Manduka mat might be the right choice. Since I first wrote about yoga mats a few years ago, Manduka has made improvements in their production line as a result of inquiries by customers like me. They now have zero-waste production for many of their mats, including the eKO Lite. Both the Lite and the eKO SuperLite are made from biodegradable natural tree rubber and no toxic chemicals are used in the manufacturing process. The eKO SuperLite is totally foldable and will fit snugly into your suitcase or backpack. The eKO Lite is a bit thicker and heavier, so provides more padding but it is a slightly less portable yoga mat. Manduka mats are famously durable, but don’t expect a lifetime guarantee for their travel mats like you get with their PRO yoga mats. I do love practicing on the eKO SuperLite travel yoga mat. Yes, it’s very thin and light but it provides really good grip on the floor and for your hands and feet. If you’re looking for a really sticky yoga mat, then a Manduka eKO yoga mat is probably the right choice. There is no padding to speak of in their travel yoga mat, which means that you’ll feel very connected to the floor. On the other hand, if your knees or spine need extra padding, you won’t get it from this mat (or any travel yoga mat). Bonus tip: I had two students using the eKO SuperLite recently in Hamburg and both of them turned their mat over to use the bottom as the top. They said they find the mat slides around on the floor if it’s the “right way” up. Good tip! Manduka’s Project OM supports various causes including the Susan G. Komen foundation’s fight against breast cancer. In addition, in the US, they have a mat recycling program. When you buy a new Manduka mat you can send them your old mat, of any brand, to be recycled into new products by The Renewal Workshop. There’s not a huge amount of difference between them. The Manduka eKO SuperLite is probably a little more durable while the Jade is a little more natural feeling. I can’t see being unhappy with either one. Liforme’s Travel Mat is unique and very environmentally friendly. While I think Liforme makes the best yoga mats for home practice, their travel mat is a little heavy for a frequent traveller like me. If you’re looking for a mat to use at home that you can also take on occasional trips, this one is a great choice. Before launching the Liforme yoga mat onto the world, Liforme did years of research into environmental best practices, putting together close partnerships with local manufacturers and creating one of the best, most environmentally conscious, and technologically advanced yoga mats on the market. Liforme manufactures in a no-waste process, which I love. Plus, their raw materials are environmentally sourced and there is no PVC in sight. Their mats are made of natural rubber and eco-polyurethane that is biodegradable in normal landfills. So if you want to start a new tradition (maybe host a ceremonial full-moon mat burial in your local park?) you’re good to go with this mat! But I jest. If you’re priority is to get an eco friendly travel yoga mat, then Liforme is the mat to choose. Liforme’s Travel Mat is about the same size and weight as the Jade Travel Mat and the Manduka eKO Lite – so it’s not quite as light and packable as I’d like. But if you’re not a full-time travelling yoga teacher like me, Liforme’s Travel Mat is great for commuting and less frequent travel. I really love the texture of Liforme’s mats, which provides stability and comfort without being overly sticky like some mats. The etched laser markings that offer alignment guidance are a brilliant feature and I can imagine that they might transform your practice. In addition to their commitment to environmentalism in their production, Liforme also gives a part of its profits to Friends of the Earth, Yoga Gives Back, and the RSPCA. The lululemon (Un)Mat is light and portable. When I first wrote this post, I recommended the lululemon travel mat — and in fact, I still love to practice on the (Un)Mat. It just feels good for my practice. However, I no longer recommend lululemon yoga mats because there are just so many preferable options out there. The (Un)Mat is too thick to be foldable and honestly, I’d rather support smaller companies who are focussed on yoga — especially those who prioritize environmental concerns and social responsibility. Since the Gaiam foldable yoga mat is a popular travel mat, I felt that I should explain why we decided not to recommend it in this post. This is because it is made from PVC. We’re concerned about the already overwhelming plastic pollution problem on earth — and we think our yoga gear shouldn’t add to that! Gaiam does not provide any information about the eco-friendliness of their products on their website, leading us to believe that the environment is not a priority for them. The travel yoga mat that has earned pride of place in my carry-on suitcase is the JadeYoga Voyager mat. It is a natural rubber folding yoga mat and the lightest of the mats I have reviewed. It folds up small enough to stick it in my carry-on luggage. One of my teachers, who travels with the JadeYoga Voyager, recently told me that the best thing about it is that “it just works”. It’s sticky, not stretchy, and offers a little padding. All the other features are just icing. 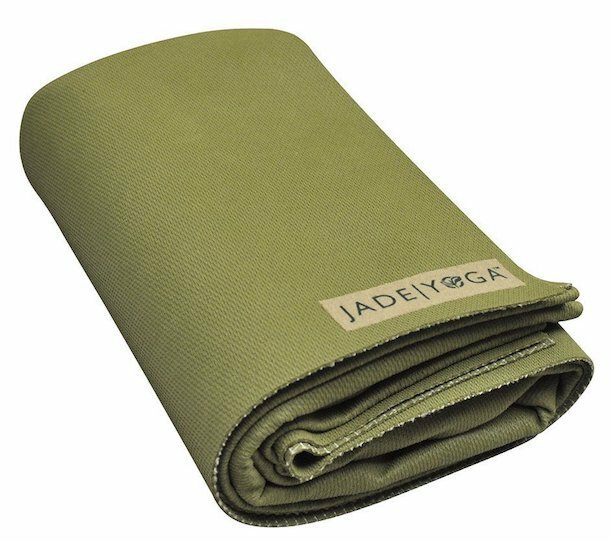 Right now, the Jade Voyager is the best travel yoga mat available for my practice and travel lifestyle. 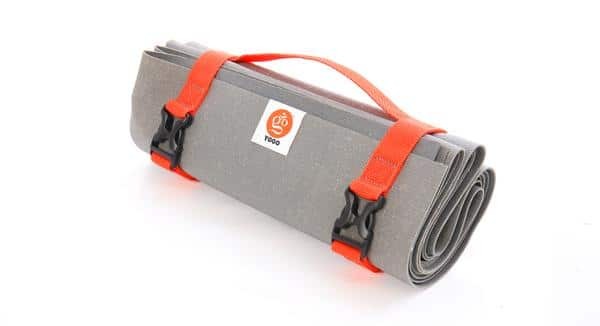 That being said, if Liforme released a super-light version of their travel yoga mat, I would be very tempted to test it out! I love having JadeYoga’s Voyager yoga mat in my carry-on suitcase. 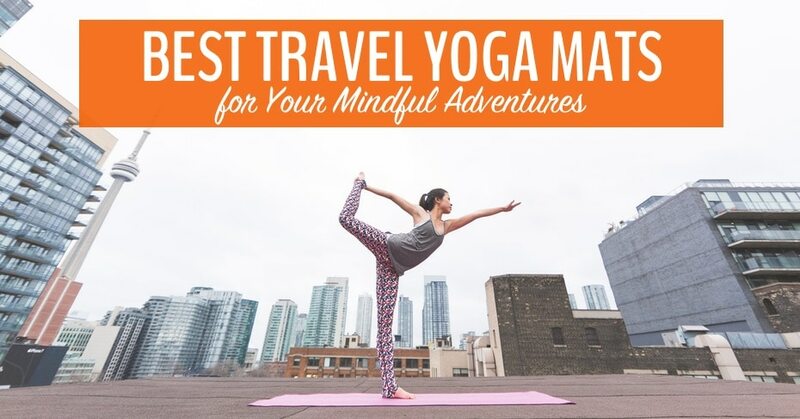 I hope this guide to travel yoga mats has been helpful in making your choice! If so, all I ask is that you leave a comment below telling me which mat, if any, you take on your mindful adventures. Pin for your mindful adventures. We know you probably can’t spend all your time doing yoga when you travel. There are times when you simply have to work. Having a vdi in the cloud from CloudDesktopOnline can help you to stay productive even in the most chilled-out locations. You can also add MS office to the same vdi by visiting www.O365CloudExperts.com powered by one of the best DaaS providers – Apps4Rent. Tagged how to travel, travel gear, yoga travel. Pingback: Treat yourself to the best yoga retreats in Bali! | My Five Acres. Travel. Adventure. Yoga. I have a yoga mat from jadeyoga and I totally love it. Pingback: The Best Eco Yoga Mat to Energize Your Practice in 2018 | My Five Acres. Travel. Adventure. Yoga. Pingback: These Vegan Headphones Will be Your Most Entertaining Travel Partner Ever | My Five Acres. Travel. Adventure. Yoga. Pingback: Is Your Yoga Mat Killing You? An Honest Look at Toxins in Yoga Mats. | My Five Acres. Travel. Adventure. Yoga. 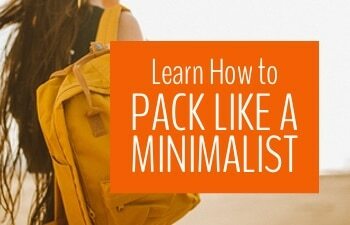 I don’t travel with a yoga mat because I try to pack as light as possible, but these are some great options if I decide to bring one at some point! As I was reading through, the JadeYoga mat stuck out to me most as well. Looks like it would fit into a carryon well and I love that they have so much focus on being environmentally friendly! I always say that I wish I could travel with my yoga mat, but never did any research to find one that you can travel with. I didn’t know that there mats you could fold up like that! I’m going to have to check it out before out big year-long trip we’re about to embark on! I thought the same, Paige! After travelling this last year without one and then getting one a few weeks ago, I’ve discovered how much better and consistent my practice is with a yoga mat around. I really want to get one of the foldable ones now – but I will have to get rid of some other items in my carry-on first! I really love having my own yoga mat with me! For some reason I never thought of taking it with me on travels but it is such a great idea! It’s hard to fit in a suitcase that’s for sure. We recently picked up a mat in a local town here in Vietnam and it feels so good to practice on a mat again! Thanks! Environmental impact is the most important factor to us, since so many mats are made of plastic and just end up in landfill after a year or so. I assume these work just as well for homebodys? My wife does yoga but not typically when we travel. I shall have to investigate further! For a home practice, I would suggest one of the thicker Lifeforme mats. They are my favourites right not, but just not as portable! I think these would make really thoughtful gifts for friends who love yoga and travel. I’d never have thought about the environmental aspect so really helpful to understand that criterion. You’re so right! To be honest, I’d love to get one of these as a gift this year :). -J. Sensitive knees can make these thinner mats a bit troublesome, but fortunately there are towels as you say. These are so much more versatile and compact than my current mat! Thank you! You’re welcome! Let us know if you get a new mat and what you think of it! The best mat is the one you can carry around easily – especially if you bike or walk to class! Or travel a lot :). LuLu is notoriously evasive about their ethical and environmental practices. There was an expose on faux fur items on the news when I was in the USA last year and they featured in that. So this is not surprising to me, apart from the other companies you mentioned here, their ethos seems to be more in line with high street shops and less in line with environmentally conscious yogis than the others. I happen to love my Manduka ekoLite for portability and stickiness! No, I haven’t had those problems before – great to know if it happens though! If I’m using it I’m either in a hotel (with carpet) or in a studio and covering up a mat of uncertain cleanliness.